Black rhinos are brownish gray, have two horns, a broad chest, thick skin, poor eyesight, excellent hearing, and a fondness for rolling in the mud. Their thick skin acts like protective plating but is sensitive, as the blood vessels are close to the skin’s surface and can easily be scarred. 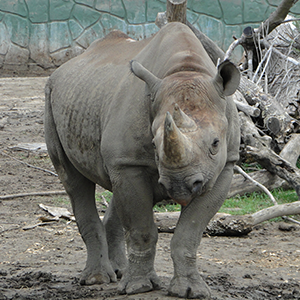 Rhinos soak in mud or roll in dust as protection against sunburn and insect bites. 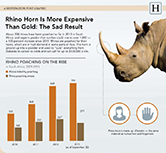 All rhinos spend the majority of the morning late afternoon and nighttime eating. During the hottest part of the day, they rest. Horns are used to dig up roots and break branches for better access to food. Black rhinos can run at 40 miles per hour. Black rhinos can go for up to five days without drinking water by obtaining moisture from succulent plants.